Are you sure you want to remove Travels and discoveries in North and Central Africa from your list? Travels and discoveries in North and Central Africa: being a journal of an exhibition undertaken under the auspices of H.B.M. 's Government in the years 1849-1855. Travels and discoveries in North and Central Africa: being a journal of an expedition undertaken under the auspices of H.B.M. 's Government in the years 1849-1855. 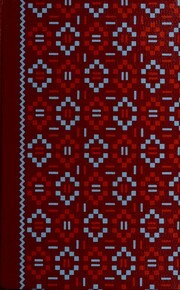 Travels and discoveries in North and Central Africa. 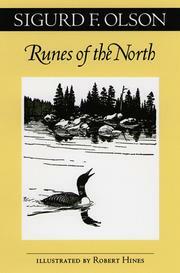 : Being a journal of an expedition undertaken under the auspices of H. B. Majesty's government. 1890, Ward, Lock and co. Travels and discoveries in North and Central Africa. : From the journal of an expedition undertaken under the auspices of H.B.M. 's government, in the years 1849-1855. Travels and discoveries in North and Central Africa. : Being a journal of an expedition undertaken under the auspices of H.B.M. 's government, in the years 1849-1855. Travels and discoveries in North and Central Africa. 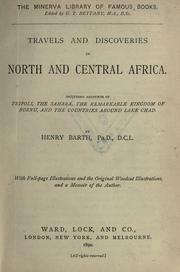 : Being a journal of an expedition undertaken under the auspices of H. B. M.'s government, in the years 1849-1855. 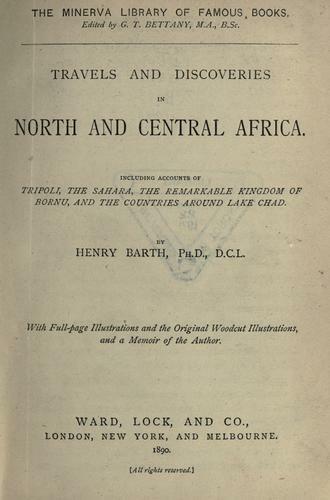 Travels and discoveries in North and Central Africa: being a journal of an expedition undertaken under the auspices of H. B. M.'s government, in the years 1849-1855. November 22, 2012 Edited by 188.190.126.70 Edited without comment.